In the wake of mega data breaches and privacy scandals, major IT outages and the introduction of tighter data protection rules in the European Union and other countries, cyber risk is now a core concern for businesses in 2019 and beyond. According to the Allianz Risk Barometer 2019, Cyber incidents (37 percent of responses) are neck-and-neck with Business interruption (BI) (37 percent of responses) as the top business risks globally . Climate change (#8 with 13 percent of responses) and Shortage of skilled workforce (#10 with 9 percent of responses) are the biggest climbers globally. At the same time, companies are more worried year-on-year about Changes in legislation and regulation (#4 with 27 percent of responses) resulting in impacts such as Brexit, trade wars and tariffs. The annual survey on global business risks from Allianz Global Corporate & Specialty (AGCS) incorporates the views of a record 2,415 experts from 86 countries including CEOs, risk managers, brokers and insurance experts. BI remains the top threat for businesses worldwide for the seventh year running and is the top risk in countries such as the U.S., Canada, Germany, Spain, Italy and China. Potential BI scenarios are becoming ever more diverse and complex in a globally connected economy, including breakdown of core IT systems, product recalls or quality issues, terrorism or political rioting or environmental pollution. Both cyber and BI risks are increasingly interlinked as ransomware attacks or accidental IT outages often result in disruption of operations and services costing hundreds of millions of dollars. Cyber incidents rank as the BI trigger most feared by businesses (50 percent of responses), followed by fire (40 percent) and natural catastrophes (38 percent). At the same time, BI is seen as the biggest cause of financial loss for businesses after a cyber incident (69 percent of responses). Cyber crime now costs an estimated $600 billion a year – up from $445 billion in 2014 . This compares with a 10-year average economic loss from natural catastrophes of $208 billion  – three times as much. While criminals use more innovative methods to steal data, commit fraud or extort money, there is also a growing cyber threat from nation states and affiliated hacker groups targeting critical infrastructure providers or stealing valuable data or trade secrets from companies. Cyber incidents are increasingly likely to spark litigation, including securities and consumer class actions. Data breaches or IT outages can generate large third party liabilities as affected customers or shareholders seek to recoup losses from companies. Natural catastrophes (28 percent of responses) again ranked third in this year’s top 10 ranking of global business risks with 2018 being a more benign version of 2017’s peak catastrophe losses, although economic losses still totaled close to $150 billion. Ongoing uncertainty over Brexit, global trade wars and tariffs fuel corporate concerns about Changes in legislation and regulation (#4 with 27 percent of responses). Climate change (#8 with 13 percent of responses) and Shortage of skilled workforce (#10 with 9 percent of responses) are the biggest climbers globally in this year’s survey. Climate change could not only be a harbinger of increasing losses and disruption from extreme weather events and natural catastrophes but is also likely to have big implications for regulation and liability considering rigid emission targets and new reporting and disclosure requirements in many sectors. Shortage of skilled workforce appears for the first time among the 10 top business risks globally as well as for many countries in Central and Eastern Europe, the UK, the U.S., Canada and Australia. It is driven by factors such as changing demographics, Brexit uncertainty and a shallow pool of talent in the digital economy. Worldwide, AGCS operates with its own teams in 34 countries and through the Allianz Group network and partners in over 200 countries and territories, employing over 4,400 people. As one of the largest Property-Casualty units of Allianz Group, we are backed by strong and stable financial ratings. In 2018, AGCS generated a total of 8.2 billion euros gross premium globally. Mean to green, machines have come a long way in taking us from one place to another. As electric vehicles herald the future of automobiles, which countries are ahead in the race for green mobility and why? As a CEO, board member or top executive, you’re often under scrutiny. Expectations are high and mistakes can be costly. Against the backdrop of social and business changes, what are the biggest threats facing directors and officers these days? In the wake of mega data breaches and privacy scandals, major IT outages and the introduction of tighter data protection rules in the European Union and other countries, cyber risk is now a core concern for businesses in 2019 and beyond. 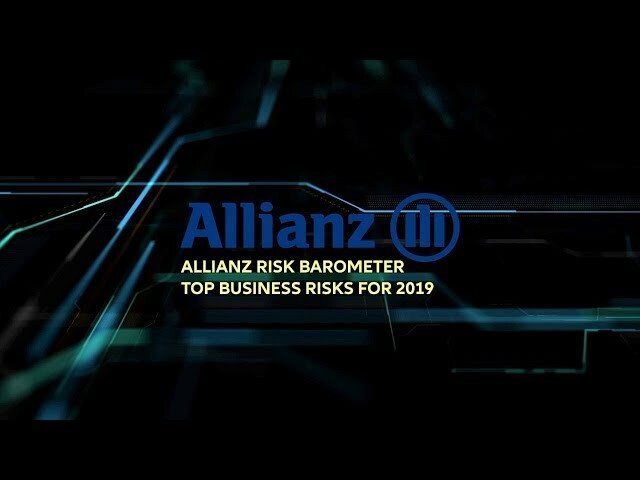 According to the Allianz Risk Barometer 2019, Cyber incidents are neck-and-neck with Business interruption as the top business risks globally. Despite the increased risks, Germany's overall economic capacity utilization will continue to increase in the coming year, according to Allianz Research. But with real GDP growth of 1.7 percent versus estimated 1.5 percent for 2018, the rate of 2016 and 2017 will not be reached. Most G20 countries including several of emerging countries enhanced their conditions for investments in low-carbon energy in the past year. Nonetheless, more renewable energy investments have to be undertaken in order to meet the Paris climate targets, according to the Allianz Climate and Energy Monitor 2018.